St. Thomas Aquinas'� Catena Aurea is a masterpiece anthology of Patristic commentary on the Gospels � it includes the work of over eighty Church Fathers. St. Thomas Aquinas� work demonstrates intimate acquaintance with the Church Fathers and is an excellent complement to the more recent attempts to understand the inner meaning of the Sacred Scriptures. For each of the four Gospel writers, the Catena Aurea starts by indicating the verses to be analyzed, then phrase-by-phrase, provides the early Fathers� insights into the passage. The unchanging rule of the Church is that �no one [is] to interpret the Sacred Scripture� contrary to the unanimous consent of the Fathers� (Vatican I). Just as in our own day there has been renewed interest in the Church Fathers, so in the 13th century, when the Catena Aurea was compiled, the western church was undergoing a similar revival of interest in the ancient patristic authors � and the works of many Eastern Fathers were translated from Greek to Latin for the first time. During this period there was increasing hunger for the true and authentic interpretation of Scripture, which the Church Fathers hold the key to. St. Thomas Aquinas was commissioned to write the Catena Aurea by Pope Urban IV, in order that an orthodox Patristic commentary on the Gospels was readily available to all readers. John Henry Newman, who is widely expected to be canonized next year, was responsible for its translation into English in 1841. Cardinal Newman hoped that the Catena would become a source of catechesis within the family and the Church. Cardinal Newman�s edition of the Catena Aurea is one of the jewels of the 19th century Catholic Restoration, making the scholarship of the Fathers available to a wider audience. As with many 19th century texts it employs a sober, dignified style of English, which is eminently suitable to the unsurpassable mysteries of the Catholic Faith. 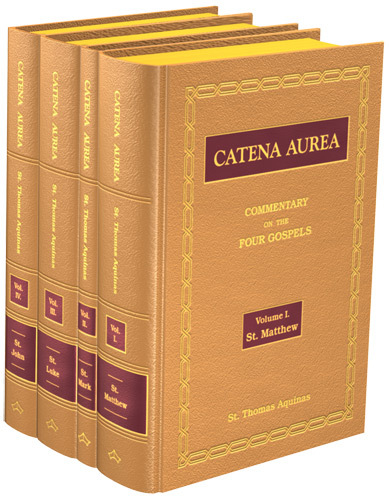 The Catena Aurea, compiled by one of the Catholic Church�s greatest minds, is of immeasurable use to priests writing homilies, lay people engaged in private or family study or of the Gospels and religious instructors will find it an invaluable help in preparing lessons. It is the perfect companion to study the Scriptures in detail and receive the wisdom of St. Thomas on particular passages. Thomas Aquinas was born in 1225 in Sicily. He joined the Benedictine abbey of Montecassino at the age of five to begin his studies. At the age of sixteen, he was transferred to the University of Naples, where he became familiar with the revival of Aristotle and the Order of the Dominicans. Aquinas continued to study in Cologne in 1244 and Paris in 1245. Returning to Cologne, he became a lecturer in 1248. As a theologian of great renown, he travelled throughout Europe, and when not lecturing or teaching, Aquinas participated in public life and was an advisor to kings and popes. Thomas Aquinas died on March 7, 1274, and fifty years after his death, Pope John XXII proclaimed Thomas Aquinas a saint. In 1879, Pope Leo XII made Thomas Aquinas the patron saint of education. The text of this edition has been digitally reset to faithfully reproduce that of the 1841 edition of Catena Aurea as published by John Henry Parker, Oxford; and J. G. F. and J. Rivington, London 1841. By a Catena Patrum is meant a string or series of passages selected from the writings of various Fathers, and arranged for the elucidation of some portion of Scripture, as the Psalms or the Gospels. Catenas seem to have originated in the short scholia or glosses which it was customary in MSS. of the Scriptures to introduce between the lines or on the margin, perhaps in imitation of the scholiasts on the profane authors. These, as time went on, were gradually expanded, and passages from the Homilies or Sermons of the Fathers upon the same Scriptures added to them. Commentaries of both classes are very numerous. Fabriciusa�speaks of several hundred MS. Catenas in the Royal Library of France. According to Wolf and Cramerb�the earliest compiler of a Greek Catena was �cumenius, in the ixth or xth century; for the claims of Olympiodorus in the vith to be the author of the Catena on Job, have been disproved by Patricius Junius, in his edition. (Lond. 1637.) But though this may be the first regular Catena, the practice of compiling commentaries had been in use much earlier. In the East, Eustathius of Antioch in the ivth, and Procopius of Gaza in the beginning of the vith, collected �the interpretations of the ancients;� and in the West, the Commentaries on the Gospels which go under the name of Bede, (A.D. 700,) are but a summary of the authorized interpreta tions chiefly drawn from S. Augustine, S. Leo, &c., and even S. Jerome describes his Commentary on Galatians as a compendium of former writers, chiefly Origen. It may be added, that the same change took place in dogmatic teaching, as in the exposition of Scripture. This indeed was still more to be expected, for the issue of controversies and the decrees of Councils had given to the doctrinal statements of the Fathers an authority, or rather prerogative, which was never claimed for their commentaries. Accordingly, S. John Damascene�s work on the Orthodox Faith in the viiith century is scarcely more than a careful selection and combination of sentences and phrases from the great theologians who preceded him, principally S. Gregory Nazianzen. A comment or scholia by the same author upon S. Paul�s Epistles have come down to us, which are mainly taken from S. Chrysostom, but with some use of other expositors. All such commentaries have more or less merit and usefulness, but they are very inferior to the �Catena Aurea,� which is now presented to the English reader; being all of them partial and capricious, dilating on one passage, and passing unnoticed another of equal or greater difficulty; arbitrary in their selection from the Fathers, and as compilations crude and indigested. But it is impossible to read the Catena of S. Thomas, without being struck with the masterly and architectonic skill with which it is put together. A learning of the highest kind,�not a mere literary book-knowledge, which might have supplied the place of indexes and tables in ages destitute of those helps, and when every thing was to be read in unarranged and fragmentary MSS.� but a thorough acquaintance with the whole range of ecclesiastical antiquity, so as to be able to bring the substance of all that had been written on any point to bear upon the text which involved it�a familiarity with the style of each writer, so as to compress into few words the pith of a whole page, and a power of clear and orderly arrangement in this mass of knowledge, are qualities which make this Catena perhaps nearly perfect as a conspectus of Patristic interpretation. Other compilations exhibit research, industry, learning; but this, though a mere compilation, evinces a masterly command over the whole subject of Theology. The Catena is so contrived that it reads as a running commentary, the several extracts being dovetailed together by the compiler. And it consists wholly of extracts, the compiler introducing nothing of his own but the few connecting particles which link one extract to the next. There are also a few quotations headed �Glossa,� which none of the editors have been able to find in any author, and which from their character, being briefly introductory of a new chapter or a new subject, may be probably assigned to the compiler; though even this is dispensed with whenever it is possible: when a Father will furnish the words for such transition or connection, they are dexterously introduced. In the Gospel of S. Matthew there are only a few other passages which seem to belong to S. Thomas. These are mostly short explanations or notes upon something that seemed to need explanation in some passage quoted, and which in a modern book would have been thrown into the form of a foot note. An instance of this may be seen in p. 405. The only important passages of this kind are some Glosses on chap. xxvi. 26. which will be noticed in their place. This continuity is expressed in the title which the Author gives his work in his dedication to Pope Urban IV. �expositio continua;� the term Catena was not used till after his death. De Rubeis the Venetian editor speaks of a MS. of the xivth century in which it is so entitled, but the earlier editions have either �Glossa Continua,� or �Continuum.� The sacred text is broken into paragraphs longer or shorter; the shortest less than a verse, the longest twenty verses, and the exposition of each portion follows this order:� First, the transition from the last paragraph to that under review; if they are events, the harmony with the chronology of the other Evangelists is shewn, S. Augustine (de Consensu Evangelistarum) being the authority used for this: then comes the literal, or, what is called, the historical exposition. Where different Fathers have given different explanations, they are introduced generally in the order of the most obvious and literal first, and so proceeding to the most recondite, by the words �Vel aliter.� Then if any important doctrine hinges upon any part of the passage or comma, selections are given from the most approved treatises on the subject; e.g. on chap. v. 17, a lengthened summary of the arguments against the Manicheans from Aug. cont. Faust. ; on chap. xi. 21. long extracts from Aug. de Bono Perseveranti�; on viii. 2. a short passage from Damascenus de Fid. Orth. as if for the purpose of referring the reader to a treatise which contains a full discussion of the doctrine implied in the words, �And he stretched forth his hand, and touched him;� on xiii. 29. on the question of toleration, Aug. ep. ad Vincentium is quoted. And the comment on the portion is wound up with what is variously called the mystical, moral, allegorical, tropical, tropological, or spiritual sense. The peculiar exposition of Origen, which seems to hold a mean place between the historical and the authorized mystical interpretation, is accordingly often inserted between these. The quotations do not profess to be made with scrupulous adherence to the words of the original. But they are not (a very few excepted) abridgments in the words of the compiler, but condensations in their own languageb. How admirably this is done may be seen by any one who will take the trouble of collating a few pages of some of the more diffuse writers, e.g. S. Chrysostom or Origen, with the Catena. For instances particularly in which a sentence is made up of clauses gathered from distant pages, see the summary of the Sermon on the Mount, chap. vii. in fin., and a quotation from Chrysostom on chap. xxiii. 26. Nor is it the case with this Catena as it seems to be with every other, that some one commentary has been taken as a nucleus or basis, into which other extracts have been inserted. Dr. Cramer says, that Chrysostom is the staple of all the Greek Catenas on S. Matthew; but though S. Thomas held Chrysostom in such esteem that he is reported to have said �malle se uti Chrysostomi libris in Matth�um quam possidere fruique Lutetia Parisiorum,� (pr�f. Ben.) and though he has drawn upon the Homilies very largely, it is no more than he has done upon nearly all the principal commentaries. If any book might be supposed to have been his guide more than another it would be Rabanus Maurus; though we should not say that he quoted any other writers mediately through Rabanus, yet this compiler seems often to have guided him to quotations in S. Augustine, Gregory, and the general treatises of the Latin Fathers. With respect to the fidelity of the references, putting aside the connective Gloss� which may probably be assigned to S. Thomas himself, there are very few (as far as the translation has hitherto proceeded) which it has not been possible to find. Of these, some are quoted from S. Augustine�s Sermons, and among the multitude of doubtful and spurious compositions of this class, it is probable that the extracts to which they belong may be found, though it was scarcely worth while to spend much time in the search of a few unimportant passages. But there are two passages of serious moment, one on Matt. xvi. 18. the other on Luke xxii. 19. quoted from S. Cyril, which require a remark. The first affir-ming the supremacy of the successors of S. Peter is quoted from �Cyril. in lib. Thes.� but occurs no where in S. Cyril�s writings. Accordingly it has been made the groundwork of an old charge against S. Thomas (lately revived by a German writer, see Ellendorf Hist. Bl�tter) of forgery, which however has been amply refuted by Guyart and Nicolai. In the dedication to another of his works, �Opusculum contra errores Gr�corum� addressed to Pope Urban IV. he says, Libellum ab excellentia vestra mihi exhibitum diligenter perlegi, in quo inveni quamplurima ad nostr� fidei assertionem utilia. Consideravi autem quod ejus fructus posset apud plurimos impediri propter qu�dam in auctoritatibus SS. Patrum contenta, qu� dubia esse videntur. The other passage is affirmatory of Transubstantiation, and quoted from S. Cyril without any specification of place; on this Father Simon (Hist. Crit. c. 33.) observes, that S. Cyril�s commentaries on the New Testament have come down to us imperfect, and this very passage occurs quoted under the name of Cyril in the second part of the Greek Catena of Possinus. (in Matt. xxvii. 28.) The words �imo quem bibas quem manduces,� on chap. v. 27. are not in the earlier editions of the Catena, but were inserted (perhaps by the Louvain Editor) from the original text of S. Augustine. Of the authors cited, the Catena contains nearly all that is material in S. Chrysostom�s Homilies on S. Matthew, S. Jerome�s Commentary, S. Hilary�s Canons, and the Glossa Ordinaria all through the Gospel. The Latin commentary of Pseudo-Chrysostom is cited fully till about the middle of chap. viii. after which it is cited more rarely. At this place the Benedictine editor notes a hiatus in some of the MSS. of Chrysostom. S. Augustine de Cons. Ev. and In Sermonem Domini in Mont. are nearly incorporated into the Catena, and from ch. xvi. to the end, Origen�s Commentaries on S. Matthew. It is generally supposed that Aquinas was ignorant of Greek, and that therefore he must have quoted the Greek authors in Translations; but his own words in his dedication to Pope Urban seem to imply otherwise. �Interdum etiam sensum posui, verba dimisi, pr�cipue in Homiliario Chrysostomi propter hoc quod est translatio vitiosa.� That for Chrysostom he used neither the version of Anianus, (as the Benedictine editor of Chrys. supposed,) nor the current Latin version, is evident on the slightest comparison with his quotations. However this may be, he has in several instances quite missed the sense of the Greek. The Catena begins to quote Origen�s Commentary on S. Matt. at chap. xvi. though our fragment of it begins as early as chap. xiii. It uses the Old Interpretation, which Huet conjectures to have been the work of Bellator, or of some contemporary of Cassiodorus. This version will be found in the Ben. Ed. of Origen, and is according to Huet barbarous and full of errors. Great accidental value is given to many of the inedited Greek Catenas by the extracts which they contain from lost works; in this on S. Matt. are quoted two writers, whose works do not seem to have been printed. The first is Remigius, which is frequently cited throughout. The commentary on S. Matthew of Remigius, a Monk of Auxerre in the ixth century, is extant in MS. in several libraries, but the only part of it which has ever been printed is the Preface, in Fontani Nov� Eruditorum Delici�, Florence 1793. One short passage concerning the dates of the Gospels, which is quoted in S. Thomas�s Proem, is not found in this Preface, but a passage in S. Thomas�s Proem to S. Mark quoted from Remigius super Matt. occurs in it. This would be proof enough of the identity of the Remigius of the Catena with the inedited Commentary described by Fontani. But he has also printed in the same volume several homilies of Remigius, which he says are only extracts or abridgments (apocop�) of the Commentary. On comparing these with the quotations in the Catena, they answer exactly to that description, the substance is the same, the words only a little different. Haymo is much more rarely quoted. The quotations do not correspond with the �Homilies on the Gospels� printed with his name at Paris, 1545, but there is much the same kind of resemblance between them, as between the quotations and the Homilies of Remigius. It may perhaps be conjectured, that he also may have written a commentary of which the Homilies were abridgments. The Enarrationes in Matth�um printed as the work of the Archbishop Anselm (Cologne, 1612) are ascribed by Cave to Anselm Laudunensis, and by others to William of Paris who died in 1249. This is partly a compilation and partly original. It does not seem used in the Catena, but it has been referred to in this translation as containing many passages cited in the Catena, under the title Gloss., and which appeared to have been drawn by both authors from some common source. A few passages are quoted from Bede. Of these some are from his Homilies on the Gospels, some from his Commentary on Luke. There is among Bede�s works a Commentary on S. Matthew, and in one or two instances this is referred to by Nicolai, but on looking at the quotations in older editions of the Catena, it is merely �Bed. in Hom.� To many quotations of Remigius and Rabanus, which agreed in sense with this Commentary on Matthew, the mark �e Beda� has been added, because he was the earliest author in which the translator found them; but an inspection of this Commentary will make it very doubtful whether it is Bede�s. First, he does not mention it in the catalogue which he gives of his own works at the end of the Hist. Eccl. (p. 222. ed. Smith.) Secondly, those on Mark and Luke (which he does mention there) are introduced by Epistles to Acca, Bishop of Hexham. Thirdly, The style of these is different, being full and copious, that on Matthew short, and �per saltus.� Fourthly, Comparing Rabanus� numerous quotations from Bede, they seem to be all taken from the comments on the parallel passages of Mark and Luke. But a great deal of what is given as original in Rabanus coincides with the Commentary on S. Matth. in question. Is it an abridgment of Rabanus, or did they only both draw upon their recollections of the Fathers? The Commentary on S. Paul�s Epistles printed among Bede�s Works, and which is a compilation chiefly from S. Augustine, seems to have been proved by Mabillon to be the work of Florus the Deacon, (Mab. Vet. Analecta, i. 12.) The following extracts from Bede�s Preface to S. Luke illustrate the manner of compiling such Commentaries then in fashion. Bede excused himself from the task because it had been so fully performed by Ambrose. Acca answers that there were many things in Ambrose so eloquent and high, that they could only be understood by Doctors, and something weaker was wanted for the unlearned; that S. Gregory had not been afraid to rifle all the Fathers for his homilies on the Gospels, and in short it might be said of every thing with the comic poet, �Nihil sit dictum quod non sit dictum prius.� Bede then describes the method he had pursued; �Having gathered around me the works of the Fathers, truly the most worthy to be employed in such a task, I set myself diligently to look out what S. Ambrose, what Augustine, what Gregory most keen-eyed, (as his name signifies,) the Apostle of our nation, what the Translator of the Sacred Story Jerome, and what the other Fathers have thought upon the words of Luke. This I forthwith committed to paper either in the very words of the author, or where abridgment was needed in my own. To save the labour of inserting a reference to the author in each case in my text, I have marked the first letters of his name in the margin, being anxious that none should take me for a plagiarist, endeavouring to pass off as my own the words of greater men.� Vol. v. p. 215. ed. Col. The Translation has been made from the Venetian edition of 1775, which professes to give the original text of the Catena without the alterations of Nicolai. For by the repeated reprints�and no book went through more during the two first centuries after the invention of printing�the text had become so corrupt��tam frequentes in eam irrepserant et tam enormes corruptel�, tot depravatse voces, tot involut� constructiones, tot perturbat� phrases, tot pr�sertim ex Gr�cis autoribus autoritates adulterat�, tot vitios� versiones, tot mutilati textus, tot indices omissi vel pr�postere annotati, tot hiantes et imperfecti sensus occurrebant ut eas mirer tam impense laudari potuisse qu� tam turpiter aberrassent.� (Pr�f. Nicol.) Nicolai therefore in 1657 undertook a recension of the text, for which he employed, not MSS. or early editions of the Catena, (the Venetian editor thinks it probable that he used only two editions, one a Parisian, the other an Antwerp,) but had recourse to the authorities themselves; his aim being, not so much to give it as it came from S. Thomas, but to improve the usefulness of the work, as what it is indeed, a complete syllabus of Catholic theology. But as the Venetian edition is wretchedly printed, it has been corrected throughout by a reference to Nicolai, (ed. Lugd. 1686,) and the references have all been verified afresh and adapted to the best editions of the Fathers. No reference has been given to any passage which the translator has not verified for himself substantially in its own original place; but in those places only in which there was any doubt or difficulty about the meaning, or where an important doctrine was involved, or any important variety of reading between the two editions of the Catena, has he attentively collated the passage of the Catena with the original; in a very few has he introduced any alteration or addition from the originals, and that has been sometimes noticed in the note. Where a reference could not be found, it has been marked �non occurrit;� of these the majority are those Gloss� which are most probably to be ascribed to S. Thomas: of the rest, some had escaped the diligence of Nicolai, only one or two which Nic. had marked as found, the present translator has not been able to find. Where no note of reference is put, it is to be understood that the passage is in each case in the author�s commentary on that chapter and verse of S. Matt. ; as the only note of reference to which must have been �in locum,� it was thought a perpetual repetition of that note was needless. To aid in referring to S. Chrys. the number of the Homily has been given at the first place where each is referred to. The references to Scripture have been verified anew, (those in the Psalms conformed to the numeration of the English Bible,) and many more given which the previous editions omit. The text of the Gospel commented upon is given from the E. V.; but all passages quoted in the body of the comment are translated from the Latin as there given, which is often important when the remarks are upon words which have no equivalent in our version, e.g. �supersubstantialis� in c. vi. 11. There is no uniformity in the editions in the mode of printing the sacred text. The MSS. and earlier editions do not contain it, so that it is probable that it was so published by Aquinas, especially as nearly the whole is worked into the series of comment; the next class of editions have the sacred text, occupying a small space in the centre of the upper part of the page, and the Catena arranged around it; and at last the commata or paragraphs, which it was clearly S. Thomas�s intention to make, were divided, and in some editions the portion of text was inserted between them, in others each chapter was printed at the head of its own comment, divided into the same paragraphs, with letters referring to the paragraphs of the Catena. It only remains to add, that the Editors are indebted for the Translation of St. Matthew, as well as for the above introductory remarks, to the Rev. Mark Pattison, M. A. Fellow of Lincoln College. "Baronius Press is publishing very nice books. Their hand missal for the older Mass is wonderful. They have some good tools for Scripture. I was very impressed also by their Divine Intimacy." "You may decide that you don't care, or you might really like (or need) the fresher text. I will take newly typeset text over a photocopy �"